Are you ready for more information about NewGen Restores’ cleaning services, straight from the horse’s mouth? 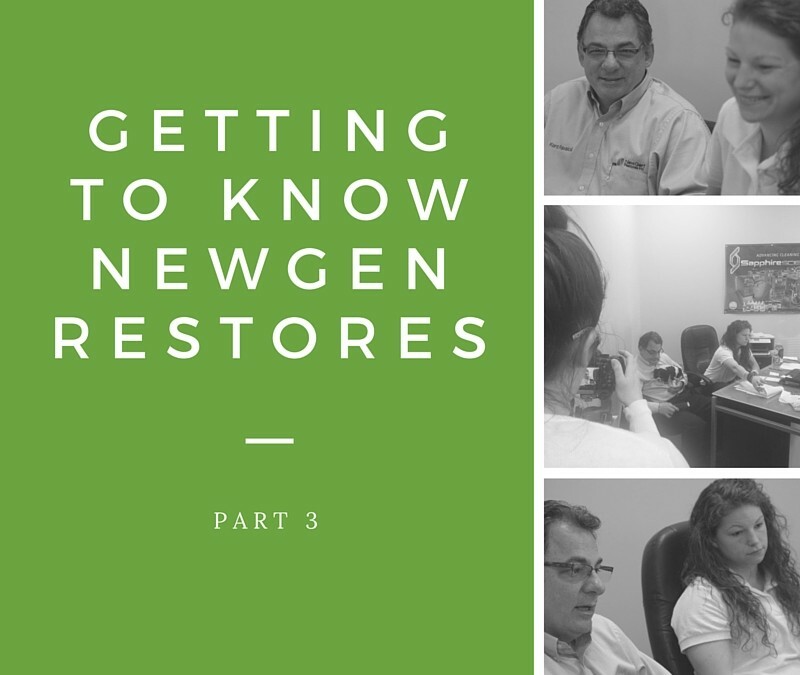 In this four part series, we sat down with Kent and Liz Ravaioli to discuss in more detail how NewGen Restores can help you give your home or commercial space a new lease of life. In Part 1, we talked about measurements and why it’s important to hire a cleaning company that’s licensed, bonded and insured. In Part 2, we talked about how the company’s schedule can accommodate commercial and residential spaces alike. And now, in the third installment, it’s time to deal with some of the more burning questions which you might normally be afraid to ask. How long will it take for everything to dry after you’re done? What does preparing my space for cleaning entail? More importantly, is the cleaning process harmful to my baby or pets? How Can Customers Prepare A Space For Your Service? Normally, we move all the furniture out of the way ourselves and put it back where it was once we’re done. However, we don’t want to be liable for any breakages, so we ask our customers to clear all knickknacks and other breakables and put them in a safe place. It’s also very helpful if you clear the floor of any items, as this will help the process go quicker and smoother. Also, depending on the weather, it’s a good idea to set your thermostat to between 68 to 72 degrees. This will help the drying process. How Long Will It Take For The Space To Dry? Drying time may take as little as a couple of hours or more, depending on the circumstances. Drying time is affected in many ways. Temperature, humidity, air circulation and even the density of the carpet pile all have an effect on drying time. Heavier carpet will take longer to dry than a carpet that is not as dense. It also depends on how dirty the carpet was. Dirtier carpet requires more cleaning solution and additional rinsing, which means it will take longer to dry. However, we thoroughly rinse and extract all water when we’re done with the cleaning process. This means that, while your carpet will be moist, there will be absolutely no standing water anywhere in your space. Is Your Cleaning Process Baby And Pet Safe? When we’re done with our service, your space will be perfectly baby and pet safe. The cleaning agents we use during our cleaning process are based off a ph scale that goes up to 14. It’s the same scale you use to test the quality of your pool water. 7 is neutral. Anything below is acidic; and anything above is alkaline. Of course, by nature, cleaning will require chemicals that are either acidic or alkaline. However, once we’re done with our final rinse it’s left at a ph of 7, making it neutral and perfectly safe. Everything is rinsed thoroughly irrespective of the service we carry out Whether its upholstery, tile and grout or even hardwood floors, you can rest assured that we’ll leave it entirely ph neutral. In fact, feel free to put your face against the carpet to feel just how fresh and soft it is after we’re done!